© 2013 Monty Bruce Training Center. All rights reserved. "Good Enough" just won't Cut it! We understand that it takes much preparation and training to get a horse ready for the show pen. You have to care about what you do and train to be the best every day. Our goal is to help your horse be the best that he can be. “Good enough” just don't cut it, for us. This is how Monty has built his reputation as being one of the very best in the industry. Find out the Show Results first. 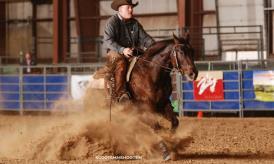 Monty Bruce is a National Reined Cow Horse 2A Judge. He knows what the Judges are looking for in the show pen.